ORTELIUS, A - Frisia Occidentalis. Size : 17.1 x 21.7 inches. / 43.5 x 55.2 cm. 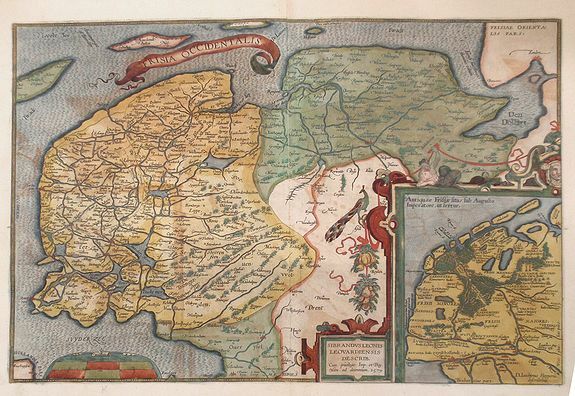 Description :Map of northern province of the Netherlands, Friesland, based from a manuscript map by Sibrandus Leo. Included is and inset of map of the seat of ancient Frisia under emperor Augustus, based on a map by Joachim Hopper. The inset is bordered by a wonderful decorative frame including a pheasant and fruits. Beautiful original colour throughout the map. Accompanying Latin text on verso. Condition : Very small puncture in bottom right corner margin; offset color transfer seen on print.